Red, white, and chic all over. The July 4th holiday calls for easy fashion. I'm so excited to share that I've teamed up with Johnnalynn Lynch of the Atlanta based blog StushiGal Style, and Alina Dinh of the San Francisco based blog, Style by Alina, to bring you guys a fashionable "Coast to Coast" street style series. We will be sharing our personal take on trends and our first feature is highlighting our favorite looks for Independence Day from Deb Shops. Whether your weekend will consist of BBQs, fireworks, spicy cocktails (yes, red hot pepper spicy), or day trips to the beach, the Coast to Coast Style girls have got you covered! We want to make sure your looking stylish while celebrating ;). I like to dress patriotic, but not overboard. I think a hint of "USA" does the trick. Channel your inner Uncle Sam. The two requirements for my holiday look? Comfy and classic. I reach for denim when looking to edge up my outfit. How cute are these bleached out denim shorts from Deb Shops? I love how American they look because of the cloud wash. The spots of blue all over truly draw attention. I also adore these destroyed denim shorts with flag-printed exposed pockets. Pair with an off the shoulder sweatshirt and your ready for the fireworks! This year, after celebrating with friends, the BF and I plan to drive to the beach and watch the fireworks over the ocean from all the neighboring towns. It involves some serious walking since parking is hard to find down by the water. 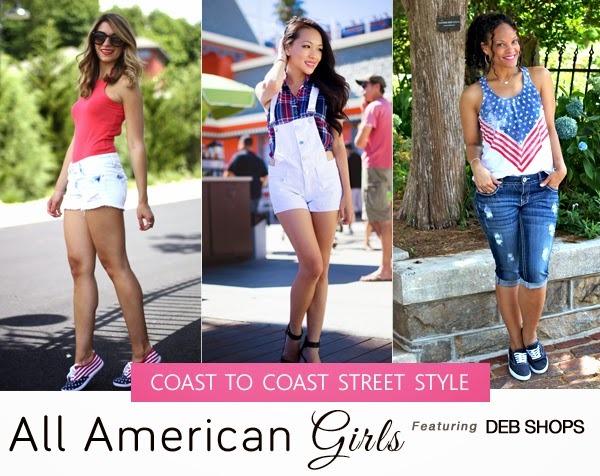 These American Flag inspired low top sneakers from Deb Shops are perfect for the occasion! They are not only festive and fun, but super comfy. I urge you to be unique with your 4th of July style and have fun with it! For more inspiration, be sure to stop by Style by Alina and StushiGal Style. From stars, to stripes, to solids, we've got you covered for your Independence day outfit. Follow along the hashtag #C2CStreetStyle on Instagram, Twitter and Facebook for more yankee doodle fun. Keep scrolling for the giveaway details! To help you stay chic all summer long, we have teamed up with Deb Shops to offer one lucky reader a $75 gift card! Entering is super easy. Just follow the below instructions and enter via the Rafflecopter. Rules: Use the Rafflecopter form below to enter daily. Besides liking Deb Shops on Facebook and commenting below, all other entries are optional. The giveaway ends on July 14th and is open to U.S, Alaska, and Hawaii residents only. Must be 18+ to enter. This is a sponsored post by Deb Shops. All opinions are my own. Love this! Simple but so perfect for the 4th! I love seeing all the Red/White/Blue clothes out right now! I love your take on the patriotic look. Your sneaks are the cutest! I love you shoes! This is such a simple cute look! I love it, you look great! You are so seriously beyond cute! Love the outfit and sparklers!! Thank you for this wonderful giveaway! Im following you :) I am going to be at the beach this weekend! I can't wait! What better place to be :)! Thanks for entering the giveaway Krystin! I love the color of and neckline on that top! Great 4th of July outfit! Isn't it fab?! It's actually a body suit. It's so soft and the back is cut-out. I love this all American look theses shoes are adorable! My plans for the weekend include a bbq,time with family and maybe fireworks. I love your sneakers. Thanks Donna! Hope the weather clears up for some fireworks on Friday! Friday we are going to a 4th of July bbq, Saturday we are going on a 7 mile hike, and Sunday is our Community Day! Excellent plans :). I like the 7 mile hike idea. Enjoy it!! I'll be going to my sister-in-law's house for a cookout. We're having a family cookout.